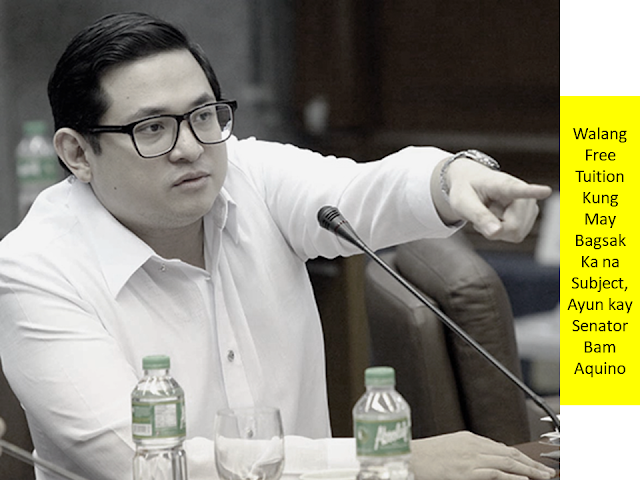 A free tuition law granting free college education in 2018 will not cover students with failing grades, according to Senator Bam Aquino, author of the law said Sunday. He clarified however that after the student passed the subjects, he can qualify again of the free tuition. Watch the video below. 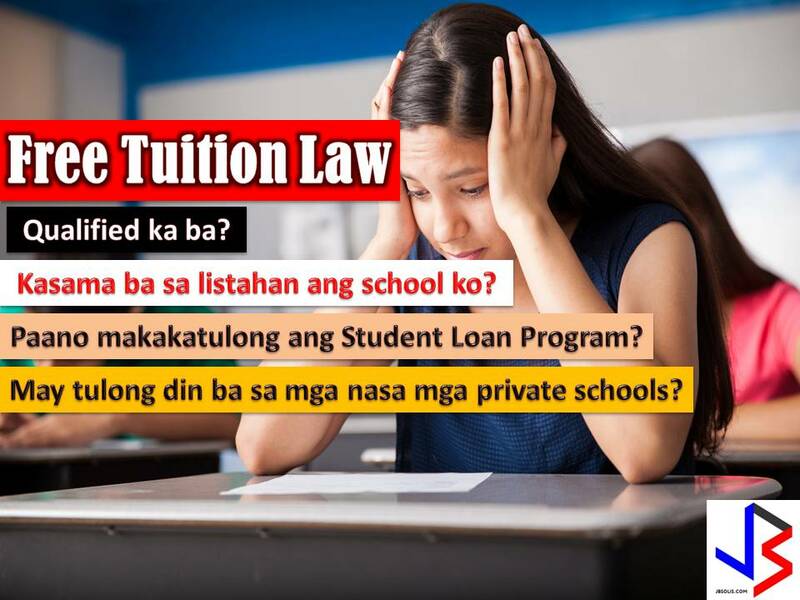 Now that President Rodrigo Duterte signed a bill granting free tuition and other fees for students in state universities and colleges (SUCs), as well as local universities and colleges (LUCs) and technical-vocational institutions (TVIs), full implementation of the law is expected next year. Public hails Duterte's move to sign the bill that will ease the financial burden of the parents with students currently enrolled in college. 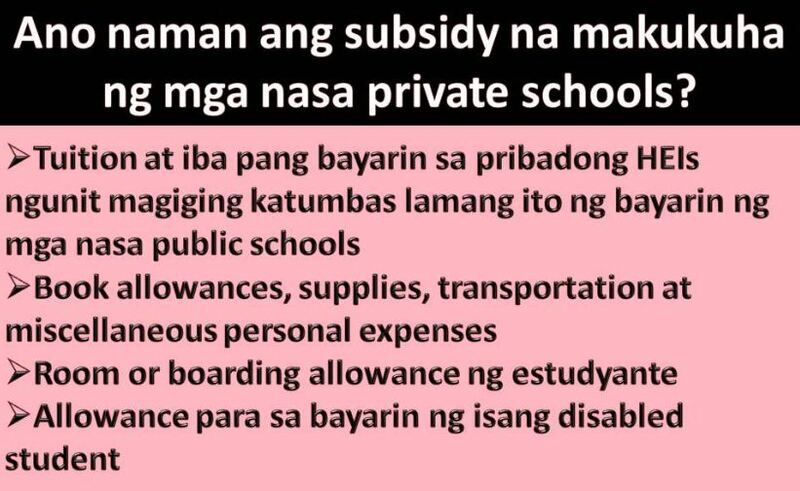 Having a college student is not a joke because education in the Philippines is not cheap. With Free Tuition Law, millions of student can go to college or earn a degree for free through government schools nationwide. WHO ARE QUALIFIED OF ENTITLED OF FREE TUITION? Students in state-run technical-vocational institutions (TVIs) under the Technical Education and Skills Development Authority (TESDA). TVIs provide non-degree programs aimed at preparing technicians, paraprofessionals and other categories of middle-level workers. WHO ARE NOT QUALIFIED OR NOT ELIGIBLE? The law states that students ineligible of the free tertiary education shall be charged the tuition and other school fees, as determined by the respective boards of the SUCs and LUCs, and in the case of state-run TVIs, to be determined by the TESDA. How about students who are enrolled in privates Higher Education Institutions (HEIs)? 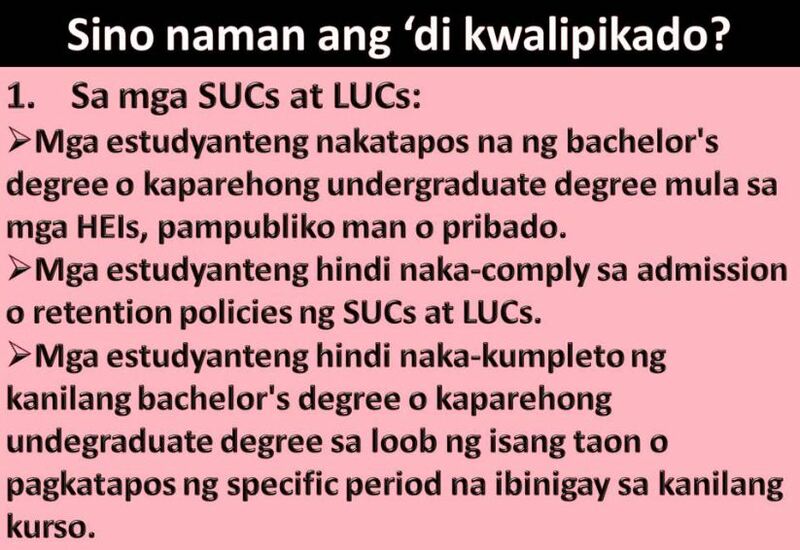 Under Section 7 of the law, it states that tertiary education subsidy shall be established for Filipino students enrolled or who shall enroll in undergraduate post-secondary programs of SUCs, LUCs, private higher education institutions, and private and state-run technical-vocational institutions. Allowance for books, supplies, transportation and miscellaneous personal expenses, including a reasonable allowance for documented rental or purchase of a personal computer or laptop and other education-related expenses. Allowance for expenses related to the disability of a disabled student. The one-time cost of obtaining the first professional credentials or qualifications. WHAT IS STUDENT LOAN PROGRAM? The law mandates creation of a student loan program for tertiary education.The amount necessary to fund the program shall be included in the budget of CHED and TESDA. Those who availed of the loan for their undergraduate degrees may still avail of another cycle of student loan for their pursuit of graduate studies, including medicine and law only after they have fully paid the previously availed loan. 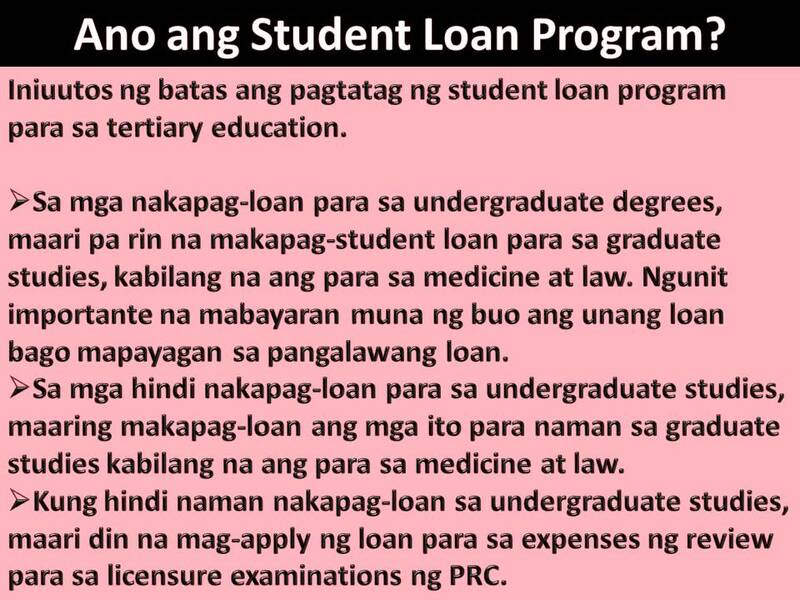 Those who did not avail of the loan program for their undergraduate studies may avail of it to pursue graduate studies, including medicine and law. Those who did not avail of the loan for their undergraduate studies may avail of the loan program for their review expenses for licensure examinations administered by the Professional Regulation Commission. HOW TO REPAY STUDENT LOAN PROGRAM? Repayment of the loan amount or a percentage thereof will be incorporated in the person’s monthly Social Security System (SSS) or Government Service Insurance System (GSIS) contribution. The schedule of the repayment and the interest rates shall be formulated by the UniFAST Board. Payment of the loan amount shall begin “once the beneficiary secures any gainful employment with compensation, remuneration or earnings that reach the Compulsory Repayment Threshold.